Hiring? 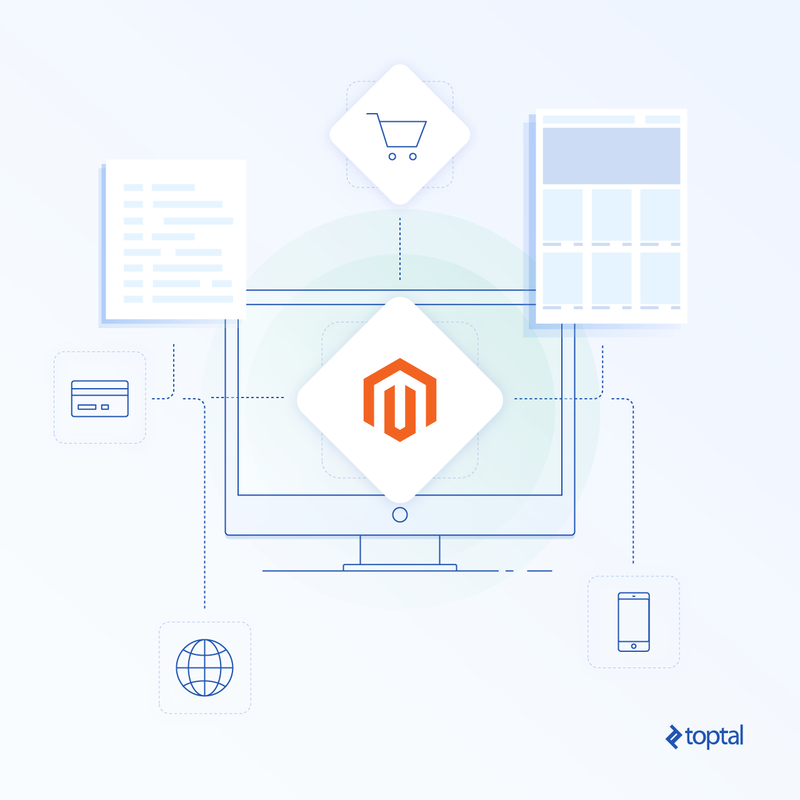 Toptal handpicks top Magento developers to suit your needs. Magento is an open-source platform for building online stores that also provides omni-channel experiences to your customers. First released in 2008, it has grown continually and become the most popular eCommerce platform. Over 250,000 merchants worldwide are using the Magento Commerce platform, which represents around 30% of the total market share. As big as the Magento ecosystem is, it can easily confuse newcomers. To help orient you, we’ll give an overview of the different approaches and versions of Magento available for building an online store and some of the resources available for doing so. Building a brand new Magento website from scratch. Migrating to Magento from a different eCommerce platform. Magento features an extensible theme, modular structure, and all the functionality required for setting an online store up quickly. This includes product and customer management, sales management, reports, payment processing, and caching and indexing capabilities, among many others. All of this functionality can be easily extended or customized to your needs. However, some development work will be needed depending on the complexity of your requirements. There is a huge community behind Magento, including Magento agencies and third-party extension providers, so there are thousands of extensions to choose from to fully personalize your store or connect it to third-party systems like payment engines and ERPs. These extensions come at different prices depending on your requirements, with several of them available for free. There is also a huge pool of Magento agencies and freelance Magento developers all over the world that provide Magento customization services. If you already have an online store running on a different platform, there are several data migration tools that could help you migrate most of your data across to Magento with little effort, such as Cart2Cart to port your store from WooCommerce, the Shopify to Magento migration tool, or the Magento Mass Importer (MAGMI) for a more general approach. These tools can import your product and sales data, but you will still need to customize the theme of your website and to extend some the platform to meet the requirements specific to your business, including the installation and setup of third-party extensions. For this process, you will have to hire a dedicated Magento web developer to transform all your data accordingly if you want to have your new Magento store running smoothly in a short period of time. Magento 1 and 2 are both being supported by Magento simultaneously. This is the most stable version of Magento. Despite being around a decade old—somewhat ancient, by today’s standards—it is still proving to be very popular, and Magento 2 is having a hard time matching its popularity. This version of Magento is nearing its end of life, so it might sound risky to use it. Nevertheless, it is still the easiest way to get started with Magento, with a very straightforward installation process and well-built architecture. As a result, it will probably be supported by the community for a long time even when official support is terminated at the end of 2018. Furthermore, there are several tools for migrating both your code and your data from Magento 1 to Magento 2 once you feel ready to upgrade your store to version 2, so that it will not be a problem when the time comes to adopt Magento 2. This version of Magento was released in 2015. While not as mature as its predecessor, it has been quickly growing in popularity especially with the latest updates. This version comes with great features that ease web development and allow customization in a more structured manner than Magento 1. However, it is a bigger piece of software, so it is also more complex. It takes more effort to install it and more technical expertise to understand the new development pipeline, so it could be intimidating for newcomers. There are already a few hundred extensions available for Magento 2, so it is quite easy to find extensions which satisfy your requirements. However, it is important to note that these extensions are slightly more expensive for Magento 2 than its predecessor given the increased technological expertise required for building them. In contrast to Magento 1, Magento 2 supports many of the latest technologies out of the box, such as PHP 7, which offers huge performance improvements, image compression, improved browser caching, and the ability to use Varnish caching without the need to install a third-party extension, so it allows you to provide a modern online experience to your customers from the start. Magento 1 and 2 both come in two editions: Community and Enterprise. Each edition is aimed at a different merchant segment. Magento Community Edition is free of cost. This edition provides a basic eCommerce platform, but some development work will be needed for fully customizing the store to your specific needs. This is the recommended option for small merchants or merchants getting started in the eCommerce business. This edition on Magento 2 has been recently renamed Magento Open Source in an effort to make the platform more open and bring in more developers from the open source community by highlighting the license the platform is built on. Magento Enterprise Edition comes with official Magento support and the latest features. This edition is better than the Community Edition for handling large product catalogs and it comes with great performance enhancements. However, it is worth noting that Enterprise Edition support is quite limited and you would end up needing to hire your own dedicated development team. This edition is highly recommended for large clients, and there are hundreds of online stores running on this edition. It’s important to consider that this option is quite pricey, but it’s definitely worth the cost of you want the best experience for your customers. Magento 2 offers an additional option previously referred to as Enterprise Cloud Edition, which is hosted and managed directly by Magento Inc. This is in contrast to the traditional Enterprise Edition, which is hosted on either the client’s own premises or by a third party. Both the enterprise on-premises and cloud editions are now referred to as Magento Commerce on the Magento, Inc. website. This is behind a rebranding effort to promote the cloud edition over the on-premises edition, which is now referred to as Commerce. There are developers and agencies offering Magento development services and consulting all over the world, but finding the right one could be difficult. To this end, Magento keeps a directory of officially certified Magento Developers and Magento Solution Partners. Officially certified Magento Developers are experts who have deep knowledge of the platform and are able to adapt your Magento site to your needs. Thus, this is the most important qualification to look for when hiring a freelance Magento developer team or individual. Freelance developers are the best option if you want to manage the developers and communicate with them directly. Alternatively, you could hire a Magento development company or agency. This may be far more expensive than hiring a team of freelancers for custom Magento development, but Magento recommends this option for large businesses that require a dedicated development and support team, or projects with very tight deadlines. Some of these companies are registered as Magento Solution Partners, which means they have been certified by Magento, Inc. as companies with extensive experience implementing and adjusting Magento websites. In all its variations, Magento is a solid eCommerce platform. Now that you know what it takes to build your store with Magento, it’s time to get started. You won’t regret joining the Magento world! Is Magento only for new sites or can a business migrate to it from an existing eCommerce solution? Magento covers both cases. Numerous tools exist to help use existing data whether it's from another eCommerce platform or from internal company data. Is Magento 1 still worth considering? Yes. Both Magento 1 and 2 are officially supported, and each has its own set of pros and cons. Which one would be best for you depends on your requirements. Magento Enterprise Edition makes the most sense for high-volume sites, but the Community/Open Source edition is free. Whether Enterprise is worth the price tag depends on your the needs and resources of your project. The impotance of an online presence is to be able to test and build features quickly. It wasn't a very good developer experience to build with version 1. Just to have a separate front and backend would make such a bit difference! What value add Magento compared to its most similar concurrent WooCommerce? This is a very clear introduction to Magento. I think the most important part in any web project or company is having the right people (developers & designers) to help manage your property. Knowing the right person to hire for a particular budget without disappointments is the most important.